In Acts 19, the apostle Paul sets out for Ephesus on his third missionary journey and confronts the Ephesians for worshipping the goddess Diana. Diana was just a disguised version of Jezebel, the detestable ‘Queen of Heaven.’ Diana was also known as Semiramis and many other names in ancient Babylon, as was her counterpart, the sun god Baal (Nimrod, etc). The idolatry involved was Mother and Son worship, fertility worship and the worship of the celestials. Diana represents the spirit of Jezebel from Revelation 2:20 Nevertheless, I have this against you: You tolerate that woman Jezebel, who calls herself a prophet. By her teaching she misleads my servants into sexual immorality and the eating of food sacrificed to idols. Jeremiah 44:15-18 Then all the men which knew that their wives had burned incense unto other gods, and all the women that stood by, a great multitude, even all the people that dwelt in the land of Egypt, in Pathros, answered Jeremiah, saying, 16 As for the word that thou hast spoken unto us in the name of the LORD, we will not hearken unto thee. 17 But we will certainly do whatsoever thing goeth forth out of our own mouth, to burn incense unto the queen of heaven, and to pour out drink offerings unto her, as we have done, we, and our fathers, our kings, and our princes, in the cities of Judah, and in the streets of Jerusalem: for then had we plenty of victuals, and were well, and saw no evil. 18 But since we left off to burn incense to the queen of heaven, and to pour out drink offerings unto her, we have wanted all things, and have been consumed by the sword and by the famine. Diana was worshipped as the moon goddess and Mother of all living things, both man and nature. Every year in Ephesus, a festival was held in her honor to celebrate her birthday in which the whole city participated in drunkenness and immorality. Like the Israelites had done before them, the Ephesians also had turned their backs on the Lord to stubbornly practice these customs and follow this false goddess down a path of destruction. The Encyclopedia of Wicca & Witchcraft describes Diana as “the Queen of Heaven, goddess of the moon, and the keeper of the hearts and souls of those who honor her.” 1 Pagans worship this moon goddess as the spouse of the sun god Baal, also referred to as Baalim (plural) in the Old Testament. In witchcraft, everything revolves around balancing powers; hence the female goddess is said to reign as the power opposite the male god. Nimrod was the founder of the Tower of Babel (Genesis 10:10, 11:1-9) and his wife was named Semiramis. The ancients believed that after his death, he ascended to the sun and became known as the sun god Baal. Baal is also another name for Molech (Jeremiah 19:5, 32:35). Ashtaroth was another name for the wife of Baal. This title also refers to many other names such as Ishtar and Astarte, the fertility goddesses of the Assyrians and Babylonians. ‘Easter’ is derived from these female goddesses’ names. The Old Testament is full of examples of what God thought of the worship of Baal (Judges 6, I Kings & II Kings) as well as his counterpart, Ashtaroth (Judges 10:6). 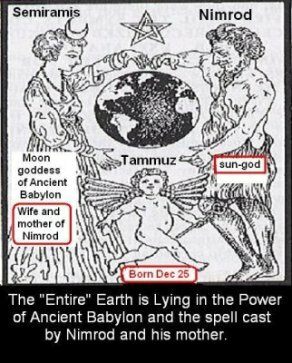 But it can be summed up in Judges 2:13, “And they forsook the LORD, and served Baal and Ashtaroth.” From this passage, it is clear to see that in order to serve the sun god Baal and/or his moon goddess bride by any name, one must first turn their back on the Lord. Diana was the Ephesians’ version of the Babylonian Semiratis. Diana’s Temple, also called the Temple of Artemis, is one of the Seven Wonders of the World. It is located in Ephesus, which is modern day Turkey. It was built in 560 B.C. by King Croesus of Lydia and took approximately 120 years to build. It was designed by a Greek architect by the name of Chersiphron. The Apostle Paul came to preach the Good News at Ephesus around 54 A.D., which was in between the Temple’s first and second destruction. In approximately 56 A.D., Paul spoke out against the false goddess, Diana. This threatened the livelihood of the townsmen at Ephesus who made their living by manufacturing silver shrines of the goddess. A man by the name of Demetrius called a meeting of his like businessmen and addressed the issue. The men became angered and began to shout, “Great is Diana of the Ephesians!” A crowd began to gather and soon a riot broke out and there was much confusion in the city. The townspeople rushed the amphitheater and were finally calmed and dispersed by the mayor. He feared the commotion would draw the attention of the Roman government and bring about legal charges for the city (Acts 19). The seeds that Paul’s preaching planted there took many years to grow but in God’s timing, it bore the fruit that resulted in the destruction of Diana’s well known Temple at Ephesus. Many Ephesians received the gift of eternal life as a result of Paul’s good work among them. Unfortunately, Paul’s message did not extinguish the worship of Diana, as it only disguised itself in other forms. This idolatry is still rampant today and has even found its way into the worship services of most churches in the United States of America as well as other countries around the world by cleverly disguising itself as ‘Christian’. Although it still comes in the form of Mother and Child and fertility worship, it somehow goes unrecognized by the vast majority. Two of the most deceptive methods are the worship of Ishtar and the worship of the Virgin Mary. The question remains unanswered as to why the ‘Christian’ Council of Nicea in 325 A.D. even discussed the appropriate time to honor a pagan goddess. There is no justification for this and the Bible blatantly opposes such worship. The results of doing so are detailed in Jeremiah 44:15-18 (previously quoted). The Virgin Mary, the object of adoration for those of the Catholic faith, is not the same Mary as the mother of Jesus because they also give her the title ‘Queen of Heaven’. Marian devotion (the worship of Mary) is thought to have been started by a group of people known as the Collyridians. Women would decorate a square chair by covering it with fine linen and on a certain day of the year, make cakes out of bread and offer them as a sacrifice to the Virgin Mary.12 The Lord rebukes this act in Jeremiah 44:15-18 as well. Syncretism has no place in the true Church and should be exposed and rebuked for the sin that it is. It is clear to see why Paul spoke out against the worship of the goddess Diana. She is indeed the one referred to as the Queen of Heaven in the Old Testament. The sins involved in her worship were many and included things such as idolatry, sexual perversion, child sacrifice and the worship of the sun and moon. Paul was very well aware of the dangers of these sins and wanted the people of Ephesus to see their need for repentance and be reconciled with God. The names of the gods and goddesses may have changed throughout the cultures but the focus of worship remains the same. God the Creator changed names for His glory (like Abram to Abraham) throughout the Bible. The devil apparently changes names for his glory, too. After all, it is much easier to lead people astray if they are unaware of the true origins and reasons for their worship. It should be pointed out that changing the name does not change the object. Many today are ignorant to the fact that they are participating in the same rituals practiced and handed down by the Babylonians. And after these things I saw another angel come down from heaven, having great power; and the earth was lightened with his glory. 2 And he cried mightily with a strong voice, saying, Babylon the great is fallen, is fallen, and is become the habitation of devils, and the hold of every foul spirit, and a cage of every unclean and hateful bird. 3 For all nations have drunk of the wine of the wrath of her fornication, and the kings of the earth have committed fornication with her, and the merchants of the earth are waxed rich through the abundance of her delicacies. 4 And I heard another voice from heaven, saying, Come out of her, my people, that ye be not partakers of her sins, and that ye receive not of her plagues. 5 For her sins have reached unto heaven, and God hath remembered her iniquities. 6 Reward her even as she rewarded you, and double unto her double according to her works: in the cup which she hath filled fill to her double. 7 How much she hath glorified herself, and lived deliciously, so much torment and sorrow give her: for she saith in her heart, I sit a queen, and am no widow, and shall see no sorrow. 8 Therefore shall her plagues come in one day, death, and mourning, and famine; and she shall be utterly burned with fire: for strong is the Lord God who judgeth her. 9 And the kings of the earth, who have committed fornication and lived deliciously with her, shall bewail her, and lament for her, when they shall see the smoke of her burning, 10 Standing afar off for the fear of her torment, saying, Alas, alas that great city Babylon, that mighty city! for in one hour is thy judgment come. The Bible teaches us that ignorance will be no excuse for those who do not follow the ways of God. Hosea 4:6, “My people are destroyed for lack of knowledge: because thou hast rejected knowledge, I will also reject thee, that thou shalt be no priest to me: seeing thou hast forgotten the law of thy God, I will also forget thy children.” This penalty is sure to be executed on Judgment Day upon all of those who do not come out of Babylon and its practices and be separate! Revelation 2:7 Whoever has ears, let them hear what the Spirit says to the churches. To the one who is victorious, I will give the right to eat from the tree of life, which is in the paradise of God. 1 Raven Grimassi, Encyclopedia of Wicca and Witchcraft. (St. Paul, MN: Llewellyn Publicaions, 2003), 120. 2 E.J. Banks, International Standard Bible Encyclopedia. (Wm. B. Eerdmans Publishing Co., 1939), Diana; Artemis. 3 Alexander Hislop, The Two Babylons. (London: Houlston & Wright, 1762), 28 & 29. 4 Ralph Woodrow, Babylon Mystery Religion (Ralph Woodrow Evangelistic Association, Inc., 1966), 8. 5 M. L’Abbe’ De Tressan, Mythology Compared with History: Or, The Fables of the Ancients Elucidated from Historical Records. (London: The Strand, 1797), 61. 6 O. Seemann, The Mythology of Greece and Rome: With Special References to its Use in Art. (New York: Harper & Brothers Publishers, 1887), 132 & 133. 7 Gotquestions.org, “What is Religious Syncretism?” Available from http://www.gotquestions.org/syncretism-religious.html; May 2012. 8 Dennis Bratcher, “Baal Worship in the Old Testament.” Available from http://www.cresourcei.org/baal.html; May 2012. 10 Citizendia.org, “Entry for ‘Temple of Artemis’”. Available from http://www.citizendia.org/Temple_of_Artemis, May 2012. 12 Stephen Benko, The Virgin Goddess: Studies in the Pagan and Christian Roots of Mariology. (Leiden; New York: E.J. Brill, 1993), 171.